TAWI-TAWI, Philippines (June 16, 2006) Ð U.S. Navy Lt. Cdr. Ronda Bouwens evaluates a child as part of a medical assistance mission deployed from the U.S. Navy hospital ship USNS Mercy (T-AH 19). 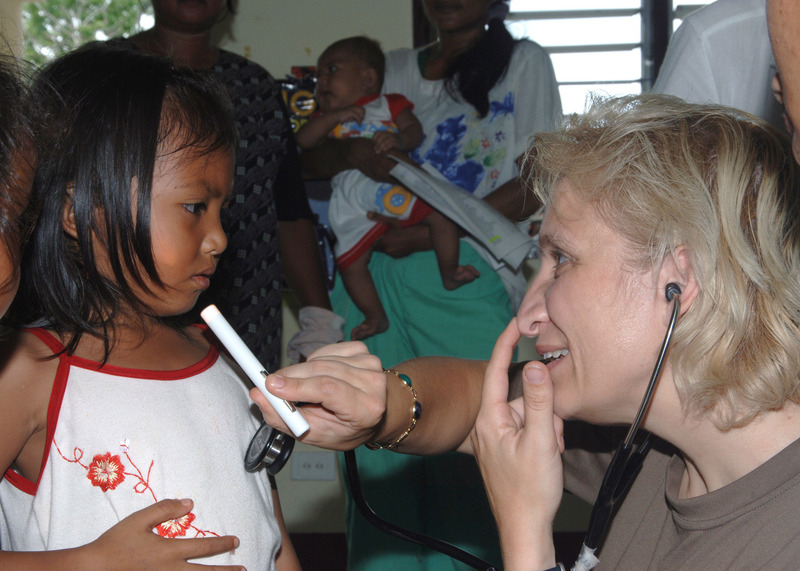 Mercy is on a five-month deployment to South Asia, Southeast Asia, and the Pacific Islands. The medical crew aboard Mercy will provide general and ophthalmology surgery, basic medical evaluation and treatment, preventive medicine treatment, dental screenings and treatment, optometry screenings, eyewear distribution, public health training and veterinary services as requested by the host nations. Like all U.S. naval forces, Mercy is able to rapidly respond to a range of situations on short notice. Mercy is uniquely capable of supporting medical and humanitarian assistance needs and is configured with special medical equipment and a robust multi-specialized medical team that can provide a range of services ashore as well as aboard the ship. The medical staff is augmented with an assistance crew, many of whom are part of nongovernmental organizations that have significant medical capabilities.